Today is a holiday. A REAL holiday which means that I am at home and the boys are at daycare. I should be cleaning the house or doing something equally productive. Just waiting for the motivation to kick in. After I dropped the boys off this morning I walked home through the park. The sun was out – calm after a wind storm – and the playground was empty of children. I took the rare opportunity to play – not on the swings but with my camera. It reminded me how much I miss taking photos outside during the winter months and how nice it is to be able to take time for photos, instead of a moment or two between “stop that” and “come here”. 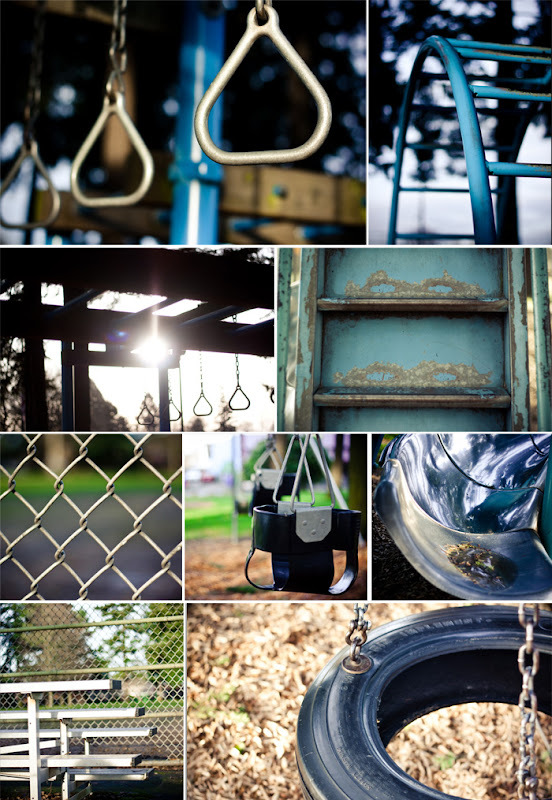 It was ironic then that I focused on the playground instead of a more adult location for my impromptu shoot. This entry was posted in Challenges, Lyrebird Images, Photography. Bookmark the permalink. That’s what being a Mom is all about!!! Great mosaic!!! Fabulous mosaic, the images are great and very well placed within the collage.